(16/P101) TRENTON –Department of Environmental Protection staff are helping prepare an urban farm for harvest as part of a Volunteer Day effort at Liberty Hall Farm on the campus of Kean University in Elizabeth. 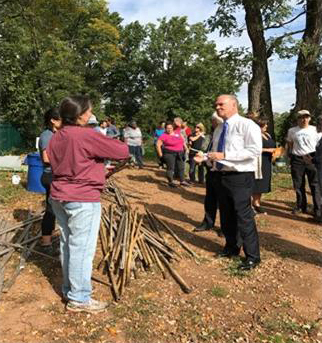 Commissioner Bob Martin, Deputy Commissioner David Glass and other DEP management and staff joined Groundwork Elizabeth’s Come Grow With Us! Community Gardening Program today to harvest crops and work the farm. Liberty Hall Farm provides locally grown produce to nearby urban communities that may lack adequate resources to access healthy fresh fruits and vegetables. The DEP volunteers are helping to weed, harvest, spread compost and perform general winter preparation work. Partners that are participating in the event include the Elizabeth Housing Authority, Elmora Public Library, Groundwork Elizabeth’s Green Team, faculty and students from Kean University, and the Elizabeth Board of Education. In April, DEP awarded a $250,000 grant to Groundwork Elizabeth’s Come Grow With Us! 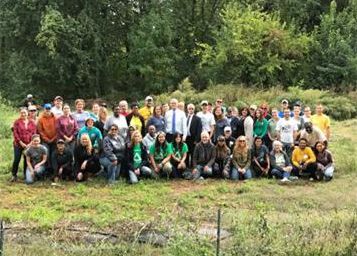 Community Gardening Program to improve access to healthy foods, develop strategies to build sustainable agricultural systems, develop green-focused career opportunities, as well as quality of life initiatives in socially and economically challenged areas of the City of Elizabeth, Union Township and other urban sections of Union County. Groundwork Elizabeth is working to achieve those goals through an initiative known as Permaculture Education Agricultural Systems (P.E.A.S. ), which is sponsored in part by DEP. The program promotes environmental stewardship, social and cultural revitalization, urban reinvestment and recycling. Founded in England in 1979, the Groundwork program was formed as an international effort to engage the public sector, private sector and community in addressing challenges in urban communities. The Groundwork Elizabeth program, an outgrowth of this effort, promotes economic and social well-being in the Elizabeth area through a variety of community-based partnerships that empower residents, businesses, educational institutions and other organizations that improve quality of life.